During its official unveiling of the HTC One (M8) yesterday, HTC made tinkerers and carrier jumpers happy by announcing that unlocked and developer editions of the device would be available as well. The unlocked version is open to switching between carriers, likely T-Mobile and AT&T in the States. The developer edition carries essentially the same unlocked phone freedom, but also comes with an unlockable bootloader. To tell you the truth, I’m actually not sure why we have both models, because last year, the unlocked edition had an unlockable bootloader as well. The difference was in the storage – one had 64GB of storage, the other only 32GB – but HTC’s spec listing says 32GB of storage for both. Odd. In terms of price, you are looking at $649 for either unit. The unlocked version comes in gunmetal gray, glacial silver, and amber gold. The developer edition only comes in gunmetal gray and amber gold. The devices all run HTC Sense 6, carry the same specs as the carrier-branded units, and will give you the same experience but with a feeling of freedom. 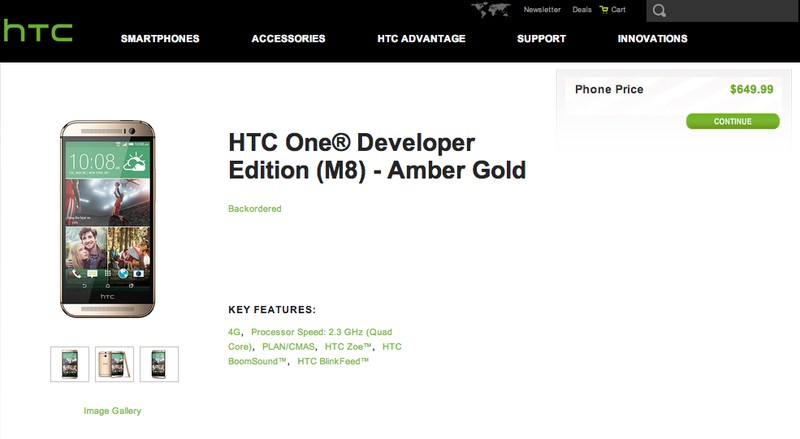 According to HTC’s site, unlocked and developer editions ship within 1-2 weeks.